The Controlled Vocabulary Keyword Catalog or CVKC, can be used with version 3.4 or later of Daminion (purchased separately). 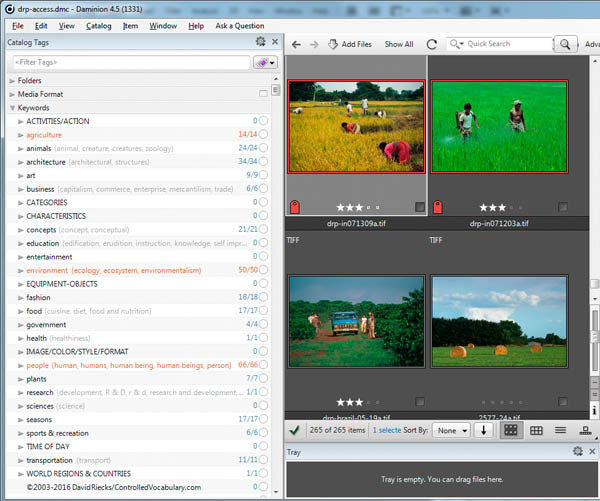 Daminion is a multi-user, digital image management system optimized for small teams. The 4.5 version uses a Windows LAN-based server and includes a read-only web-client so your Mac or Linux users can access files. The CVKC can be imported into Daminion server (or standalone) using a unicode compatible Text file formatted specifically for this image database. When installed, the Catalog Tags panel should look like what is shown in the image below. The full version 3.x of the CVKC contains approximately 11,000 terms organized in a hierarchical structure. For detailed information on how to install the CVKC see the Daminion support page. The CVKC-FAQ (Frequently Asked Questions) page covers other related questions. To request a sample of the CVKC, which contains a portion of two of the more than 20 top level hierarchies available in the full version, simply send email using the address on the Contact page and indicate you'd like the Daminion CVKC sample. A few of the more than 30 top level hierarchies can be seen in this screen capture. Information on how to download your copy of the CVKC will be sent to the email address you have provided, within 24 hours or less after payment is received*. Included in that message will be a URL, along with a username and password. Please store this information in a way that you can find later as you will need it to retrieve updates. Subscription: You can concentrate on your keywording instead of creating and maintaining a keyword catalog with this"subscription"** to the Controlled Vocabulary Keyword Catalog. You will receive periodic update notifications and be granted password protected access to the download location. All updates to the CVKC contain a file with changes noted from the previous version, in case you wish to integrate the update with your own copy of the keyword vocabulary list within Daminion. If you are interested in licensing the single-user version for Daminion standalone, please send email using the address on the Contact page and include "Daminion standalone CVKC" in the subject line. *Please note that we send your subscription information to the email address on file with PayPal. Please note that if you choose the PayPal "eCheck Payment"this option may require up to four business days for funds to clear your account. If you wish to avoid this type of delay, make sure your PayPal account is tied to a credit card, or email in advance for alternate arrangements. **The use of the Controlled Vocabulary Keyword Catalog is subject to the following terms and conditions.